The Honda’s Ecological Drive Assist System was presented in LA last week and now, Honda released images of the Japanese Insight’s EDAS which the color-changing speedometer background, that is used in the system’s guidance function. 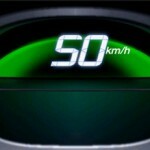 If the color behind the number is green, you’re driving efficiently and when you’re driving in the least economical way, the whole screen turns blue. 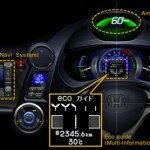 The Japan version of the Insight will also be able to integrate with the optional Honda HDD InterNavi System, and combined with this system, the EDAS can give more advice on how to enhance fuel economy while driving, specifically by looking through a driver’s history and suggesting driver-specific changes. I can’t wait to see the new Insight with EDAS in the spring of 2009.